1. Take dog out during specific times. Have your husband take the dog out at these specific times, as they are when a dog is most inclined to need to go: Five minutes after eating and 15 minutes after a hearty play time starts. Being in the right place at the right time can really help. 2. Establish a command word. 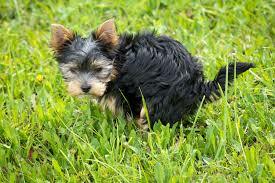 Do not tell the dog to potty unless you have already established a command word for the act. This is a common mistake that often distracts the dog or works against your goal. As soon as the dog starts to go, say your command word once in a medium tone and volume. If he doesn’t go in five minutes, take him inside and move to the next step. 3. Use a kennel. Bring the dog inside and place him inside a kennel with only enough room to lay down and stand up — no extra room. Wait 15 to 30 minutes, then take your dog back out and give him another five minutes. Repeat this process until he goes — even if that means he is in the kennel overnight. 4. Use treats. When the dog finally goes, your husband should give the dog five treats in a row while saying the command word the second after each treat goes into your dog’s mouth. These should be special meat-based treats with a super strong smell. You should only give five treats this way if the dog goes No. 2. If it goes No. 1, do the same except only offer one treat. The idea is to wait your dog out until he can’t hold it any longer. Then reward the heck out of him so he takes notice and is more motivated to go outside again in the future. While you are working on this, only use these super high value treats for successful potty actions. We want to make these treats even more valuable by being so rare.